UUVs would give U.S. Subs active sonar without revealing themselves. BAE Systems has been awarded a contract to develop a small Unmanned Underwater Vehicle (UUV) to help U.S. submarines detect and engage adversary submarines. The UUV is part of a U.S. Defense Advanced Research Projects Agency (DARPA) program to provide the U.S. Navy with advanced new tools to expand the reach and effectiveness of its underwater sensors. If the program is successful, it would provide a critical new capability to the U.S. submarine fleet that would help mitigate shortfalls projected at the end of the 2020s. A submarine’s principal defensive attribute is its stealth. As a result, submarines rarely employ active sonar, which sends out pulses of sound energy and listens for the reflection off of objects like ship or submarine hulls, because it would give away their position to an adversary using passive sonar, which relies on listening for sound emanating organically from other contacts. DARPA’s Mobile Offboard Clandestine Communications and Approach (MOCCA) program seeks to provide “extended range submarine detection and precision target tracking through collaborative operations using unmanned vehicles and active sonar techniques.” By remotely operating UUVs equipped with active sonar, U.S. submarines would be able to take advantage of active sonar’s superior detection and tracking abilities without giving away their own position. As the contract solicitation makes clear, the program presents significant technical challenges. The contract requires the UUV to be 21 inches in diameter or smaller, making it small enough to be deployed through the Virginia-class submarine’s 533 millimeter torpedo tubes (which is approximately 21 inches). That small size complicates the effectiveness of the sonar suite that it can house. Further, if the UUV’s active sonar energy is not directed properly, it has the potential to also bounce off of the submarine operating it, not just target submarines, inadvertently revealing its position. Finally, water is much more challenging than air to transmit the communications signals through to remotely operate the UUV and for the UUV to send sensor data back to the submarine operating it. But in the face of a rapidly expanding Chinese fleet, preserving and improving the combat effectiveness of its submarines is a top priority for the U.S. Navy. Admiral Harry Harris, the head of U.S. Pacific Command, has testified before Congress that the U.S. Navy’s submarines are “our principal asymmetric advantage over China,” and also that that advantage is in danger of dwindling as the Navy can only provide him about half of the submarines that he needs to meet operational requirements today. Despite the current operational demand, the U.S. Navy’s submarine inventory problems are projected to get worse over the coming decade. The U.S. Navy has 52 attack submarines today, and the previous force structure goal called for maintaining 48. But under the most recent shipbuilding projection, the attack submarine fleet would fall from 48 hulls in 2024, down to 42 in 2029, and slowly building back up to 48 in the 2040s. Independent of the difficulty expected in maintaining a fleet of 48 attack submarines, the Navy’s most recent Force Structure Analysis, released last December, calls for increasing it to 66 hulls. 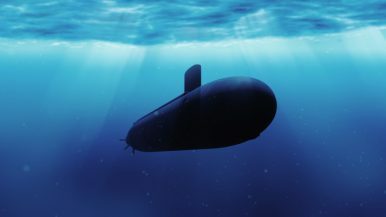 Even though shipyards face particular challenges rapidly expanding the workforce of highly skilled workers required to build submarines, the Navy and industry recently reported to Congress that they believe they can build seven additional attack submarines above current projections between now and 2030. If they can be delivered on-time, those seven additional submarines – which have not been authorized or procured yet – would bring the Navy’s attack submarine fleet up to 48 by the end of the next decade, meeting the previous force structure requirement, but still falling 12 hulls short of the new one. That shortfall in numbers is why technologies like MOCCA are critical for the U.S. Navy. BAE Systems said in a press release that the new system “will provide Navy submariners with a vital asymmetrical advantage against a rapidly proliferating undersea threat.” DARPA envisions a three-phase program stretched over more than four years to design and test the system. If successful, U.S. submarines might start receiving the new UUVs in the early- or mid-2020s, just as the size of the submarine fleet may be starting to drop.